My husband and I have always been big fans of Radio Flyer - I remember their products from my childhood and we have loved the idea of our children playing with them as well! We looked at a lot of tricycles before settling in on this one, but we've been thrilled with our choice! It goes from ages 2-5 and has an adjustable seat to make that really work. We got it for Walker just before he turned 2 and while he's just now tall enough to start to really be able to pedal with it, he's still had a great time sitting on it, being pushed around & pushing it himself. Probably the biggest selling point for us, though, was the "Co-Pilot" feature that allows a parent to both push & steer. It's helped make the trike lots of fun even before Walker could pedal himself - and I have to admit, he also enjoys pushing it and steering from behind, also helping to teach him the cause and effect of steering, which I'm a huge fan of! The handle easily attaches/detaches for whatever situation best suits at the time. 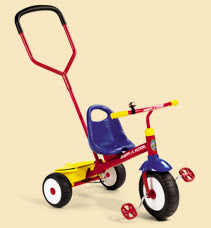 I have fond memories of the metal plate at the back of my old tricycle that you could stand on while pushing the tricycle, however Walker loves the yellow bin on the back of this trike - in fact, lots of times when "Lovey" is missing, I can find him lovingly "shoved" in the bin for safe keeping. I know that this trike is going to continue to get lots of love for a very long time at our house - it's certainly been a great purchase! Back before heading to the beach this year, with 2 almost 2 year olds in tow (my son & niece were born 3 days apart) we decided to buy a wagon to haul them & our gear to the beach and back each day. 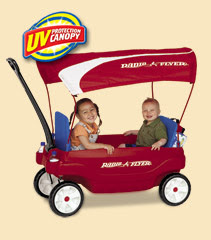 We did lots of looking and comparing and ended up with the Ultimate Family Wagon, again from Radio Flyer. I am super in love with this wagon and both kiddos loved it too! The seats are extremely flexible - 2 kids can face each other, both face forward, or the child in the back can transform the front seat into a desk. The seats also fold flat so that you can carry a sleeping/laying down infant or more gear. Both W & A were super interested as we put the wagon together and then crawled in and out of it and pushed it back and forth in the house before it ever set wheel onto the beach. It now lives in our garage and W is trying to climb into it every chance he gets. There's a nifty little "extra" compartment behind the back seat - a great place to stick a tote bag and/or other goodies and keep them away from little hands. Built-in seatbelts work wonderfully to keep little guys seated. There are 2 adult cup holders up front and then 2 more in the wagon floor for kids. The handle also folds flat for easy storage and/or transport. I also love that this model came with a UV canopy - it folds up neatly and stores in it's own handy dandy bag, but is also super easy to whip out and use on a sunny day. All-in-all, we've been delighted with both of these guys and look forward to using them for years to come! 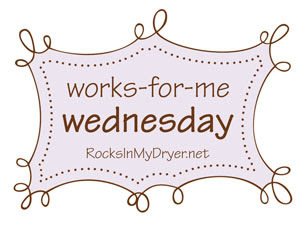 For more great toy ideas, head on over to Rocks in My Dryer!